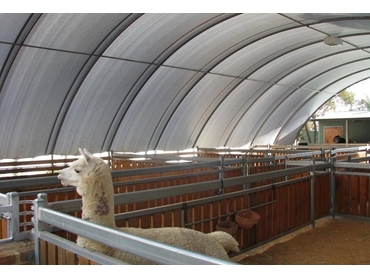 AWP Group (Advanced Weather Protection) offers the AgShelter, an economical range of dome shelters designed to house alpacas and other animals. AWP’s dome shelters feature a translucent waterproof cover to allow soft light to filter into the covered area, helping to create a pleasant atmosphere within for the animals. AgShelter dome shelters are available in 10m, 12m, 15m, 17m and 21m spans, and can be manufactured to any length to suit specific shed requirements.